Looks like lots of interest in modeling. Really like the 3D puzzle race car! Very nice, zax. Looked to be quite a variety of models on display, all of which were excellent presentations. Thank you for the tour. 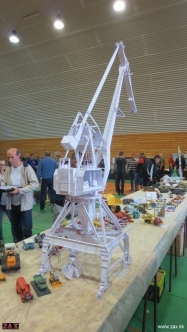 I am continually amazed by the level of expertise in the paper modeling community. That crane is a thing of beauty! Really good show. Thanks for posting.